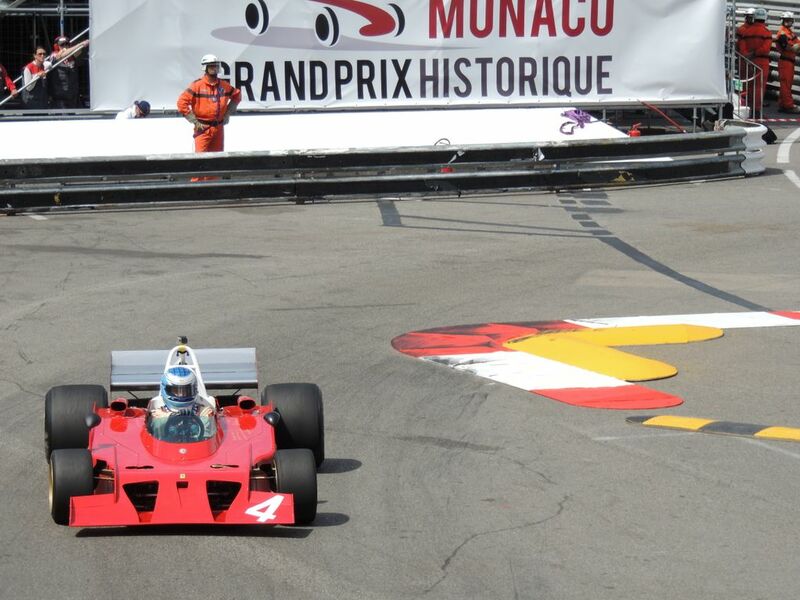 Sunday – Race Day at the 9th Grand Prix de Monaco Historique. Seven races taking place from 9:00am through to 6:30pm. The schedule allows for a 30 minute period break between each event, thus ensuring all events start on time. The breaks are taken up by track marshals clearing debris and senior officials doing laps with special guests. After a fairly overcast Saturday, the weather on Sunday cleared and much sunshine fill ed the Monaco streets. A large crowd quickly filled all the grandstands and many balconies and terraces at hotels and apartment blocks with any view of the circuit. The first race came sooner than I thought with Cannon suiting up and champing at the bit to fire up the Bugatti T35B/51 and head off to the form up grid on pit lane. 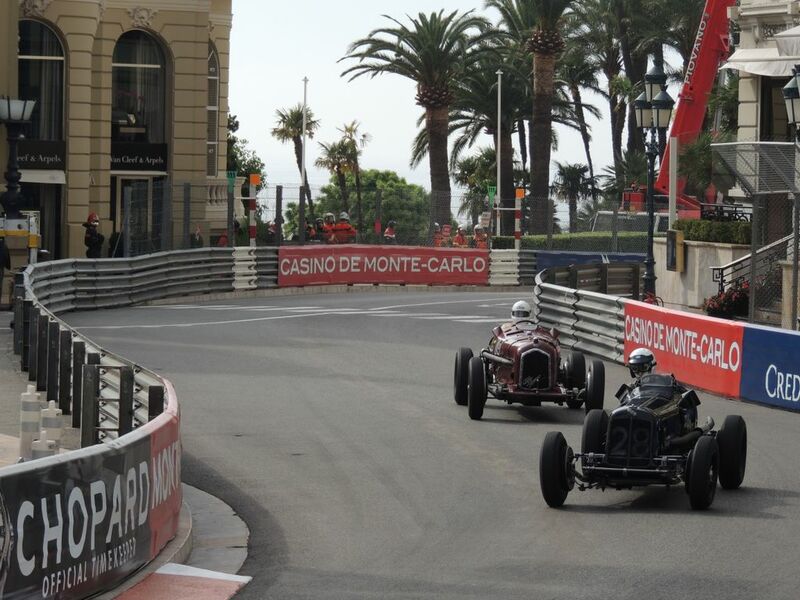 The photography point for this race was to be the outside of Casino Square through to the inside of the Hairpin. A fifteen minute walk around the harbour and through the complete length of the tunnel, around the inside of the Hairpin, past Mirabeau and up to the Hotel de Paris was required. Fortunately I had allowed just enough time to make it as the cars were on track for their warm-up lap. The race started with pole sitter Paddins Dowling off to a flying start in ERA R10B ahead of the rapid Alfa Romeo Tipo B ‘P3’ of Matthew Grist. 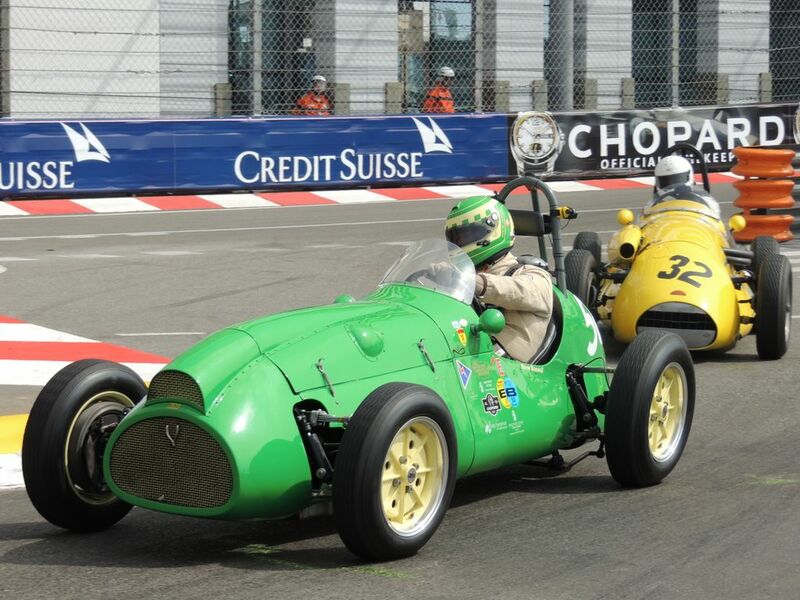 It was a 1.5 Litre versus 2.9 Litre engines, Voiturette versus Grand Prix car. The nose to tail battle continued for the entire race with the lead changing after about four laps with Grist taking first, which he held on to until the end of the race. The other stirling effort in the race must go to Melbournian Andrew Cannon who, starting in tenth place steered his Bugatti T35B/51 so very well all race overtaking the two Bugattis in front of him (Martin Halusa – T35C and Robert Newall – T35) finishing a strong sixth place, the first Bugatti home. Although one lap down at the end, his nearest Bugatti rival (Newall) finished eighteen seconds further back. Cannon even had the chance to locate the scribe at Mirabeau for a quick wave as he sped past. Cannon’s efforts were further acknowledged at that night’s Gala Dinner where he was awarded the special trophy from the Automobile Club de Monaco for the Best Presented Bugatti at the event. The wheel drama that prematurely ended Berryman’s qualifying session in his Bugatti T37A halted his confidence for the race and was a late withdrawal from the starting grid. 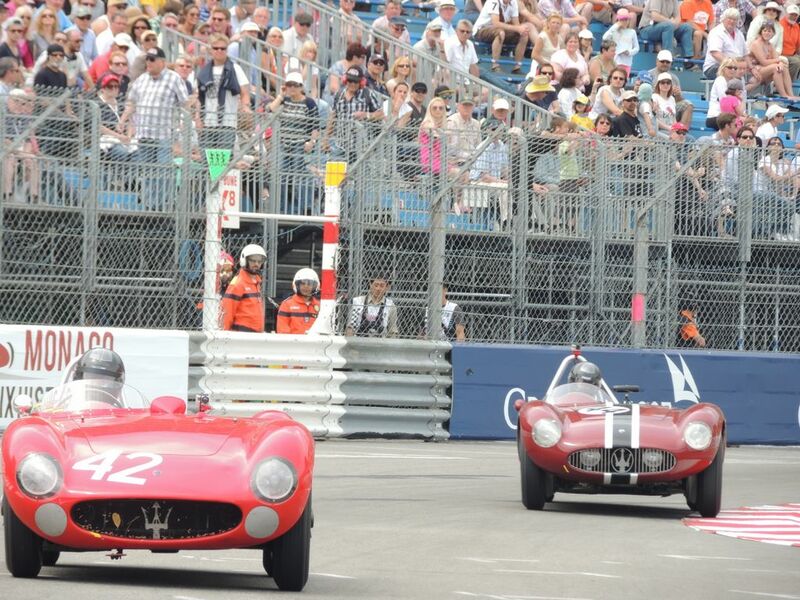 A fabulous field of Pre-1961 Grand Prix & Formula 2 cars presented itself for the second race of the day. The race was a race between rear-engine versus front-engine cars. It is of course that era of motor racing when the tide was rapidly turning from engine in the front to engine in the back. Roger Wills put his ex. Bruce McLaren 1960 Cooper T51 on pole position, and was unmatched for the race. After being excluded from the 8th edition in 2012, Julian Bronson had his Scarab F1 in full song during qualifying, but for some reason started the race at the rear of grid, gaining some places before retiring from the race. The Tec Mec 250F F1 in the hands of Tony Wood was very strong early in the race holding on to second for much, but succumbed to the ‘Piccolo’ Maserati 250F driven by the quick Frank Sttipler who eventually got past and finished narrowly ahead. Sir John Chisholm narrowly missed out on a podium position finished two one hundreds of a second further back in his Lotus 16. The 1961 to 1965 Formula One race was next, and what a highlight it was. Andy Middlehirst (Lotus 25)was dominant and unchallenged all weekend, but in the race pulled away from everyone finishing some 40 seconds ahead of the second place finisher, Sid Hoole (Cooper T66). The top finishing cars were mostly powered by the awesome screaming 1.5 Litre V8 Coventry-Climax or BRM engine. Talking engines, an unfortunate early withdrawal for the ears was Joe Colasacco’s 1.5 Litre V12 engine Ferrari 1512, which had qualified second fastest. Marco Rollinger retired after four laps in his Brabham BT3 Climax at Mirabeau. His scar was quickly air-lifted out of harm’s way. The crane doing the duties was one of nine cranes placed at 9 of the 19 corners of the street circuit. At one point the scribe looked over and it was like the crane driver was directing the car toward a balcony of an apartment (nice piece of lunge room furniture! ), but it wasn’t so as the car was laid down on a footpath behind temporary fencing. Tasmanian Scotty Taylor continued to have gear selection problems with the wrong ratios in his ex. 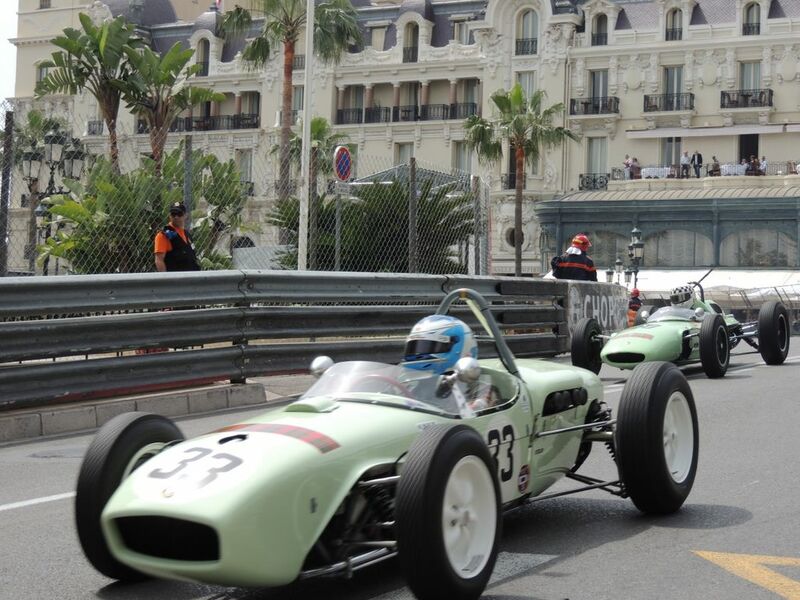 Innes Ireland Lotus 18 F1, finishing in 20th place –last car to finish (but ahead of the seven cars that failed to finish the race).Taylor was pleased to have completed another weekend of racing on the streets of Monaco – not many of us get the opportunity. Event sponsor Choppard was the next to shine with some spirited demonstration lap s of their Auto Union D-Type and Audi pre-war machines, the Auto Union driven by none other than Jacki Ickx. This was followed by fellow sponsor Renault, who demonstrated the ex. Alain Prost turbo-era Renault F1. On the way back to the paddock area to download photos and refresh the next race came out, the race for Sports-Racing cars from 1952-1955. Wandering alongside the shore line admiring the Yachts moored metres away this race would be captured from esses at either end of the swimming pool. Early favourite Alex Buncombe drove his Jaguar C-Type on the limit of adhesion all raceunder steering and over steering his way past lap after lap in exacting motion, taking the win. Gavin Pickering in the later Jaguar D-Type could only manage sixth place with two Cooper Cars filling the podium. The Bristol motored cars, the T24 of John Ure and the T33 of Fred Wakeman spread out by the end. Like the Bugattis in the pre-war race, many of these cars are adaptable with some entrants choosing to drive to and from the event as well as compete in their Jaguar, Maserati, Ferrari, etc. The beautiful 150S/200S of Michael Willins outclassed the more powerful 300S of Nicolas Chambon. We saw no fewer than eight Frazer Nash Le Mans Replicas further down the pack. The entry to the start/finish straight would be the un-tested spot to photograph the next race, the 1966-1972 Formula One race. Twitching their way out of the corner in the mostly Cosworth-DFV powered cars and onto the curved straight. On his way to second he passed some quality drivers in quality cars. Young-gun Michael Lyons took over the wheel from mum, Judy who was to drive the Surtess TS9,Roger Wills in his other event entry, the March 701 and finally Rob Hall (Matra MS120B) who finished third. If there was an award for ‘sound of the meeting’ it would most certainly have had to gone to one of the two Ferrari in this race, the 312B3 of Franco Meners. The wine of the 3-Litre V12 with its four pyramid style assembled exhausts was absolutely perfect as he ran through the up gear changes each lap on exit of the corner. Katsuaki Kubota made a start to finish win in the John Player Special Lotus 72. With two races to go a break was necessary and a quick drink stop while the camera was re-charging as the Stars & Bars Café was consumed while the 1974-1978 Formula 3 event was on, watching it on the TV in the bar. Interestingly there were 49 TV cameras around the circuit. The camera was picked up, charged enough for the final race of the day, th e 1973-1978 Non-Ground Effects Formula One race. Again there was a pre-race favourite, 2012 winner Michael Lyons in the ex. James Hunt – Penthouse sponsored Heskeith 308E. 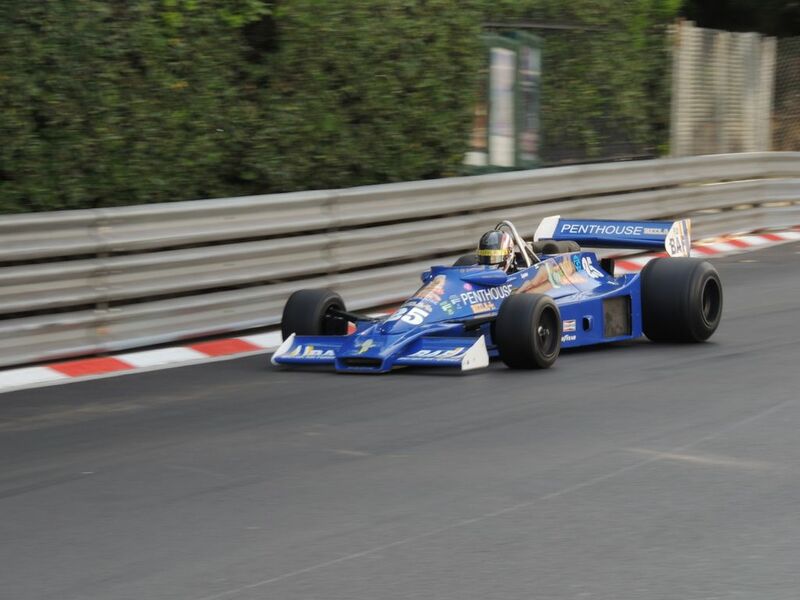 Getting in some good exercise, the scribe ran through the tunnel and back to the Mirabeau-Hairpin spot to capture this race, and to capture the sound, for the Cosworth-DFV again powered most cars in the field. Lyons was quick to pull out to a good start from Charles Nerburg and his March 731B, the gap increasing over the first few laps. The challenges were coming from Williams, Brabham, Ferrari, Renault, Fittipaldi, Lotus, Penske, Ensing, Tyrell, Surtess, Shadow, Trojan, and of course, numerous McLaren – M23 & M26 variants. The quality race was marred by accidents, which eventually resulted in the race finishing under safety car conditions, somewhat of an anti-climax way to end a great day of the most pure historic racing.